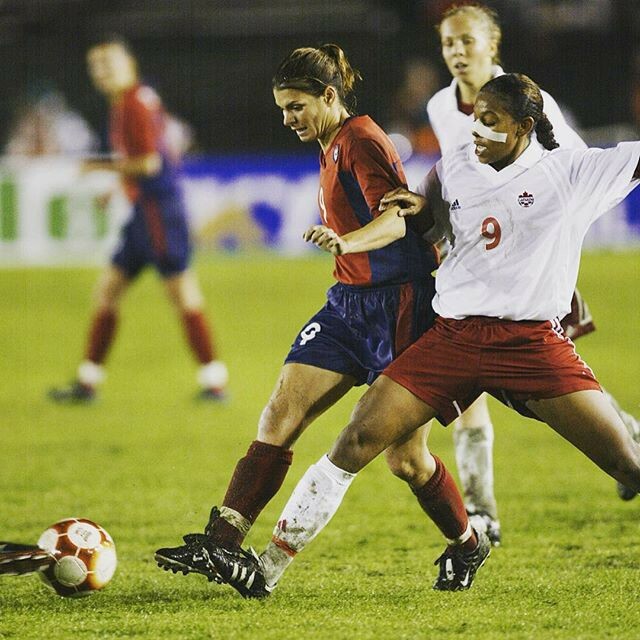 On 9 November 2002, the United States women claimed their second consecutive Gold Cup with a golden goal from Mia Hamm in extra time against Canada. The final was a matchup of the tournament’s two juggernauts, with both sides winning all of their earlier matches and conceding only a single goal between them (in Canada’s 11–1 victory over Haiti in the group stage). The two teams also had a history against each other; Canada lost to the U.S. in the 1991 and 1994 CONCACAF Women’s Championship before winning the title in 1998. Playing before a crowd of just under 7,000 on a rain and fog-filled night at the Rose Bowl in Pasadena, the U.S. took the lead with a goal from forward Tiffeny Milbrett. But Canadian striker Charmaine Hooper equalized in first-half stoppage time, scoring the tournament’s only goal against the U.S. The match went to extra time, where Hamm, whose injured shin had limited her role to that of second-half substitute, chipped Canada’s keeper from 18 yards out for the win. As finalists, both teams qualified for the 2003 Women’s World Cup. There, they met in the third place match, with the U.S. winning again, 3–1.